First of the wintering Redwings are now here, also this week whilst walking through a local woodland I watched in awe as I found a Goshawk (female) plucking at a wood pigeon on the path, it was a momentary observation as the Goss saw me then took off, but what a great sight (don't even ask where the camera was :( They are now breeding locally which is great news I'm keeping in close touch with one private landowner who really does like them, and doing well at protecting them. .
Tuesday night I did my first real wild talk which went down really well, this talk is a bit controversial and asks the question what is real wild? Also goes into how we manage nature reserves, the question is asked is it for wildlife or people? Climate change and the real cost on wildlife rears its head, and also discussed is the predation issue which leads very well into how we all seem to have lost our connectivity with the natural world, it was only supposed to be 45 minutes long, but I went on for an hour and half, but no one complained. My, lay off the Bramble Bush speech, also seemed to hit the spot especially when backed up with a species list that Bramble can contain. I met a really interesting man after the talk who has written a book about climate change and agreed with my stance on the issue, in fact if you are that person please get in touch as I do want to buy a copy of your book. Indeed someone else after the talk did say I should write a book about the talk. Yea like I have the time. This weekend is a busy one, starting Friday night is the Hawk and Owl Trust annual members conference, this year its in Somerset at Shapwick. I'm chairing the sessions and Friday night sees the first speaker and what a great start we have this year with Jemima Parry-Jones talking about Vulture decline, will be good to see Mima again. Saturday morning is more lectures then in the afternoon walks around the reserves on the levels, such as our own Shapwick Moor, and Natural Eng lands Shapwick Heath and the RSPB's magnificent Ham Wall. In the afternoon I have to slop off to Dillington House to join up with the Somerset Wildlife Trust this because its the Wildlife Trusts AGM and I'm one of its Trustees. I will be back with Hawk and Owl Trust by 1800hrs to welcome everyone back and to also welcome Fred Domeloff from Cotliegh Brewery. Fred will be bringing with him the new Long-eared Owl Beer and I will do the first tasting (just to make sure its OK) After which is the members social evening. Sunday is the local members groups round up, or what they have done in the last year, followed by Hawk and Owl Trust AGM. Sunday night back home and bed. OK unless they all start doing Shakespeare in the garden, this is the last Hornet item I'm doing this season. Its all proved very popular with lots of e mails still to answer and lots of confusion because the UK press have put out a big splash about the invasion in France by the Asian Giant Hornet. Because of this lots of harmless European and recently back from the brink Hornets are being squashed, smashed and nests destroyed. The best bit from this came from the British Museum who's very balanced approach was that there are in fact no reports of Giant Hornets in the UK, indeed they state that they probably won't be able to live here because of the wet and cold weather. If you do see what you think is a Giant Hornet, then just use the Google search box and write in Giant Hornet you will get lots of pictures and videos, then do the same for European Hornet and then compare the two. Interesting that in Germany the European Hornet has been protected for sometime with hefty fines given if they are destroyed, well good one you Germany, and yet again it seems we in the UK lag far behind with our wildlife education and legislation. Full protection for the European Hornet in the UK. Where's Bug Life in all this? Comment please! Owl surveys and re-hab monitoring next. Here it is and I do know its been a wait for all those volunteers that helped with the last 2 Long-eared Owl surveys. 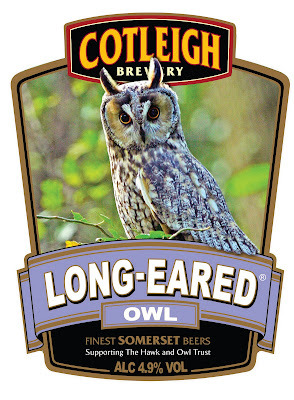 The latest news from Fred Domellof Director of Cotleigh Brewery is that Long eared Owl Beer will join the likes of Barn Owl bitter (named by me) Tawny and Snowy Owl ale. There is talk of a possible PR launch day with yours truly doing a tasting :) being accompanied by Otus the captive bred Long-eared Owl (hooo's tee total) Otus also features here on the pump clip label, picture taken by me. If the boys from Sweden are reading this, then you should be proud, as Fred is from your country, now how about Owl beers in Sweden? You have 10 species, come on boys! Lastly here is a copy of Fred's tasting notes. A rich and bright darker copper coloured ale. Full flavoured with a rich floral aroma from first gold hops. Smooth on the palate with a long lasting bitter sweet finish. Ingredients: Pale, Crystal and Chocolate Malt; Goldings, Fuggles, Northern Brewery and First Gold hops. Chris Sperring is a professional wildlife Conservationist working for Hawk and Owl Trust, he also presents and broadcasts on TV and Radio. Lectures on a wide range of subjects. Is a wildlife Photographer, writes articles for magazines and newspapers. In his spare time he studies and conserves even more Wildlife, writes music as a guitarist for the environment/wildlife rock band Raptor. And always enjoys a good debate!